Keep baby bottles, toys and sippy cups within reach and off the ground with premium sippy cup clips and toy straps from HnyBaby. Backed by a slip-resistant rubber grip, these stylish sippy straps are just the right length to keep bottles and cups from falling far. And because they can be attached to strollers, car seats, high chairs and more, you can use them at home or on the go quickly and easily. 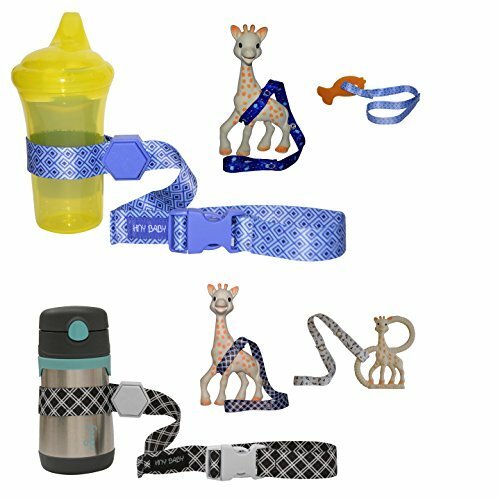 Get your 4-pack of baby bottle sippy cup straps and toy leashes from HynBaby by clicking 'Add to Cart' above now! BABY BOTTLE CUP HOLDER - These sippy cup holder straps with non-slip rubber grip keep baby bottles, cups and drinks from falling, dropping or rolling away. ONE-BUTTON ADJUSTABILITY - Every baby bottle strap features a honeycomb locking system that lets you attach, secure and remove toddler cups with ease! VERSATILE HOME & TRAVEL USE - The best products for baby and mom, these toddler sippy cup straps work with baby seats, strollers, and highchairs alike. If you have any questions about this product by Hnybaby, contact us by completing and submitting the form below. If you are looking for a specif part number, please include it with your message.